Launched by Hyderabad Industries Limited’s (HIL), Aerocon brick/block is a new generation building block that helps in creating sustainable buildings and infrastructure. The unique characteristics of these bricks like light-weight, fire resistance, etc., not only grabbed the attention of construction industry, but also made users more curious about its performance. Though there is hype in the industry about this new innovation, only few are clear about what exactly Aerocon is all about. So, in a view to help such folks, here is our small effort to put forward all the information related to Aerocon blocks. Aerocon bricks: Aerocon bricks are Autoclaved Aerated concrete (AAC) blocks made with a mixture of cement, fly ash, lime, an aerated agent, and water. During the production, fly ash and water are mixed together to form a slurry. This mixture is then heated and transferred to a high speed mixer, to which the rest of the ingredients like lime, cement, and aluminum powder are added. During mixing process, a chemical reaction takes place between the ingredients and as a result small bubbles are formed in the mixture which form the characteristic cellular or aircrete structure. A little later, when the mixture is partially set, it is wire cut into pre-determined sizes. These cut blocks are then transferred into autoclaves for high pressure steam curing. This autoclaving assisted by aeration process is what gives the unique, light-weight cellular structure as well as dimensional stability to the Aerocon block. Types of Aerocon bricks: One interesting aspect of Aerocon brick is that it lets the user build the walls of with the thickness of his choice. Contrary to the wall made by traditional bricks, walls made with Aerocon bricks are thinner but are still sustainable. However, depending on different various needs of internal and external walls, Aerocon bricks are available in different sizes and varied thickness as follows. Infill blocks: The size of the Infill Aerocon brick is 600X600 mm and the thickness varies in the ranges of 75,100,125,150,200 mm. 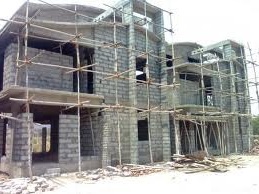 The main advantage of Infill blocks is that they can easily replace 60% of the concrete in roof slabs and thus help in saving significant amounts of concrete, steel, labor, water, plaster etc. These blocks are especially suitable for building roofs in large column-free constructions. Jumbo blocks: Jumbo blocks are typically in the size of 600X300 mm, and thickness ranges from 75,100,125,150, to 200 mm. The unique large size of Jumbo Aerocon bricks results in the usage of much fewer bricks and hence less mortar is required. These bricks are more suitable for non-load bearing walls, multi-storeid buildings etc. Thermal blocks: These blocks are also called as Aerocool thermal blocks whose size and thickness is 300X200 mm and 50 mm respectively. These blocks are ideal for roofing since they delay the transmission of heat flow and also help interiors remain warm during winters and cool during summers. What’s special about Aerocon bricks? Versatile characteristics of Aerocon blocks made them unique from the rest. Let’s have a look on few of them. Light-weight: The typical aircrete structure of Aerocon bricks resulted in light-weight blocks. Their weight is only one third the density of clay bricks which makes them easy to handle on-site. Reduced weight of the brick decreases the dead weight on the structure; hence Aerocon bricks are ideal for low load bearing soil and for seismic zones. Even for building additional floors in an existing building, Aerocon blocks are perfect choice as their less weight will not affect the stability of the structure. Using Aerocon bricks from the foundation stage of the building helps to save substantial amounts of concrete and steel. Fire resistance: Walls build with Aerocon bricks, with a minimum thickness of 100mm can resist fire for up to four hours which make them the safe choice in construction. Especially for industries and companies, which are vulnerable to fire accidents, these blocks are of much help. Sound insulation: One more interesting characteristic of Aerocon bricks is their sound insulation. A good quality Aerocon brick can minimize the sound transmission up to 42 decibels. Reputed manufactures of Aerocon bricks do have a sound transmission class rating for their blocks, which made them ideal for wall construction in hotels, auditoriums, hospitals, etc., where sound insulation is quite essential. Thermal insulation: Due to the closed cell structure of the Aerocon blocks, they provide excellent thermal insulation. They help interiors to remain cooler during summer and warmer during winter which further aid the user to save electricity bills and thus help in conserving natural resources. Strength and durability: Aerocon bricks made with higher weight ratio help in building stronger and economical structure. As they remain unaffected by the environmental conditions they ensure longer life for the building. Perfect finish and dimensional stability: The autoclaving process used in the manufacturing of Aerocon bricks gives perfect dimensions to the blocks along with low tolerances. Dimensionally perfect blocks help in building uniform, thin walls with perfect finish. Consistent quality control: As brick making is in India is an unorganized market, the quality of regular bricks often vary based on the manufacturer. Hence consistent quality control is an issue with traditional bricks which is not an issue with the Aerocon bricks. The only concern with Aerocon bricks is their high price when compared to the traditional clay bricks. The information given on AEROCON bricks is very discriptive and very useful while selecting the bricks. What is the compressive strength of aerocon bricks when compared with normal clay bricks? Yes, it will be useful to us because now a days apartments are build with aerocon. In future, many people will use this one. Thanks for giving information. What is cost of aerocon brick? & how to fix them on the roof. How much reduction in temperature? Any skill for fixing? I need the cost factor details as I am constructing a School Building.